We’re calling it early! 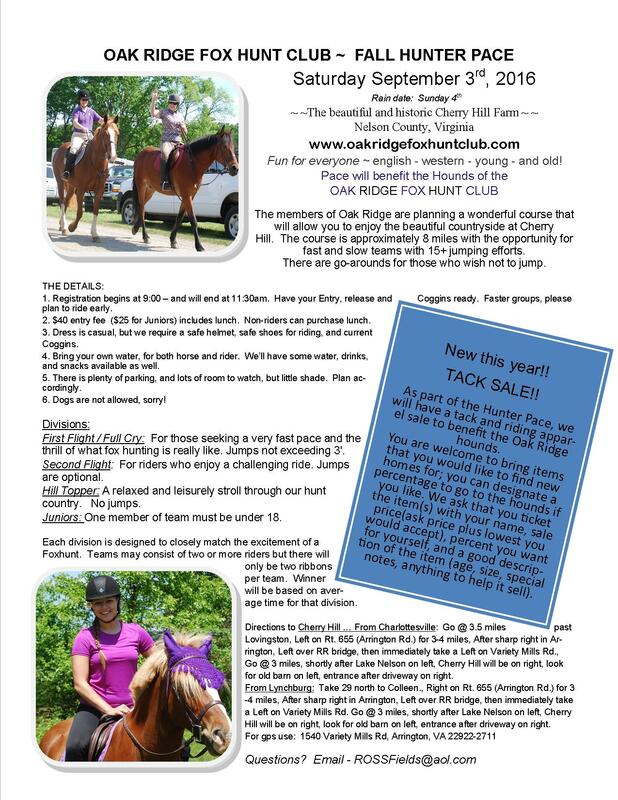 The Hunter Pace will be held on the rain date, Sunday September 3. Bill Johnson’s sudden death on October 26, followed a few days later by Vey Martini’s unexpected passing, then our wonderful Anne Henderson left us, plunging all of us into sorrow. The services for each of our friends reminded us of why we loved and admired them. Many of you came, some driving great distances so we could be together in this mournful time. Each of these individuals would want us to remember the good times, the laughter, the bracing chats at tailgates. In time, each of us will rediscover the joy they gave us, celebrate the joys to come. If we don’t embrace life, we repudiate their memories. Our challenge is to live life up to Bill, to Vey, to Ms. Henderson. I believe you will. Heat and drought didn’t deter our hounds. They found scent, would lose it, press on and find it again. The runs, mostly short, offered some reward. Hounds did enjoy a few longer runs. However, the rains have come, the mercury has plunged. The only impediment now is deer season. We have about another month of that. Our quarry sits tight so it takes more to get them up and running. Also, occasionally deer hounds, left out, join our hounds. The kids stick to the way business. Grays will soon start breeding, followed by the reds. This is the best time of every season. The hardest part is keeping your fingers and toes warm. You can forget the cold during a hard run; it’s the checks that get you. Still, it is as they used to say back in the 1940’s, “very heaven”. November 26, Saturday, the Waldingfield Beagles hunted from Tea Time. It appeared a hopeless day: windy and the tail end of that damned drought. Casting down by the lower barn, Amy Burke, carrying the horn, moved northward. The north branch of the Rockfish River, way below offered some rising moisture and strange to report, the tiny little feeder creeks still trickled. After 15 minutes of brisk walking, with some of the field casting a nervous eye at the steep drop to their left, we pushed into the area where my northernmost pasture abuts the creek between Jim and Joan Klemic’s land and mine. Zap. Out shot a flying rabbit, zigging and zagging for all he was worth. Beagles hopped on that hot line, immediately and we ran up and down, into brambles, over rocks for an hour and a half with only a few checks. That was a sporting bunny who finally ducked into a safe haven. Amy, still energetic, pick hounds up near the run-in shed by my house. What a tour de force of exciting hound work on a day I wouldn’t have given a nickel for, really. Goes to show, you never know. Unfortunately, not one Oak Ridge member was there to see this incredible run. Nor was there any food back in Headquarters. Bob had dropped off the drinks in the morning but that was it. Page Turner hurried to Ashley’s. All that was left was fried chicken but we were all famished. Not one piece remained. Thanksgiving weekend jams everyone’s schedule. In the past we have had some participation for beagling. Granted, it’s never as much as I would wish but I must realize, at long last, that few people love hound work as much as I do and even fewer want to run on foot. It’s not reasonable for me to expect you to join me as I listen to that music. Speaking of music, our hound chorus grows louder and deeper. The young entry, now part of the pack, are learning to sing as opposed to squealing. Oh, there’s a high pitched squeak every now and then but they’re getting it. How that sound makes those sultry July and August walks worth it and how I wish Stuart Jones were with me to hear it. The fuss from him if someone sang soprano! I’d counsel patience. He actually listened after venting and once the singers learn to harmonize, we were like two little kids, silly with happiness. 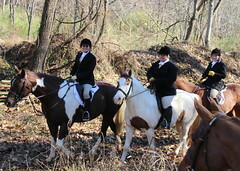 We exhibited a bit of nervousness hunting from Cherry Hill, Friday, December 2. Turned out it was lovely to be there. We felt Ms. Henderson and she sent us a few foxes. One was viewed running out of the territory. 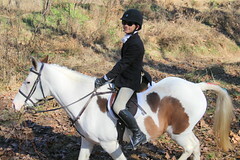 The other one, elusive, kept the hounds focused. As you know, Cherry Hill is not easy. The fox has all the advantages. Maria cast counterclockwise, starting from the graveyard. At the end of the day, hounds had reached the huge pasture across from the Brethren church on Variety Mills Road. With only one whipper-in, Becky Birnbaum, one is always a bit nervous near a paved, well used road. The pasture, filled with cattle, seemed just fine, a hint of scent down by the creek but the day was done, so we thought. The cattle charged the hounds who ran toward the road. 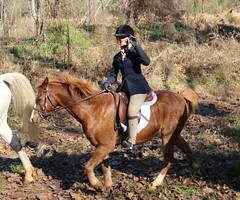 Becky, not a second’s hesitation, rode right at the cattle driving them down to the creek. Thank God, Priscilla, Sue Satterfield and Jane Andrews, each leading a field, flew up to the fence line. Hounds now had a wall of horses as Becky kept pushing the cattle down and away. Everybody made it to the trailers in good order. Quick thinking, good work. Cheers for all. The next hunt at the Cistern, colder, saw another long run with interruptions. The best part was the coyote they were chasing ran 6 feet in front of John Morris walking the fixture. Fearless fellow, both of them! Before signing off, I must mention the Fashion Show, November 13 at the Paramount. A smash. We wondered if anyone would come to this inaugural event. Come, the place was packed. The string quartet established the mood, Dorothy Chhuy’s paintings put us right into the foxhunting vistas and the models, walking down that runway like pros (some were) displayed the best turnout ever. Mark Catron came up with the idea, organizing most of it. Marian Maggiolo of Horse Country selected the models, the clothes, the music for the runway. Truly, it was fabulous. 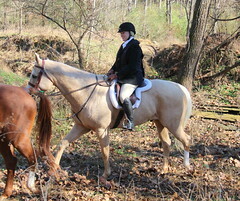 Lynn Lloyd, MFH of Red Rock Hounds, flew in from Reno, Nevada for it and Jane Winegardner, MFH of Woodford Hounds drove over from Lexington, Kentucky. 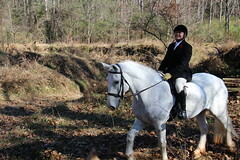 Grosvenor and Rosie Merle-Smith, MFH of Tennessee Valley Hunt as well as their daughter Nicolette added to the MFH number. There may have been more and forgive me for not knowing all that. I was working the show, a little lecture with slides, thanks to help from Dee Phillips, on the history of hunting fashion. Did anyone remember the talk about fabrics, cutting on the bias, garters? No. They all remember underpants and bras. What fun. Lynn wants me to bring this to Reno. Now Marion and I and Mark are not exactly unwilling but it has crossed our minds that we may encounter strippers. Mercy. I think Mark is already looking at flights. Marion and I are scandalized, just scandalized. Speaking of coming up with good ideas, Ronnie Thornton kicked off our kennel upgrade with a challenge. She threw a big wad of cash into the bucket. It worked. What a fund raiser. I am reminded that fundraising is the second oldest profession. I must remember to ask Ronnie about that. The money rolled in and then Mark Catron dropped off a load of two by sixes. The next thing I knew the kennels were full of men wearing tool belts and two women as well, Sara Bateman and Kathleen King. Show me a girl with a power drill. Actually show me anyone with a power drill. The workmanship was precise and pretty fast. What a huge difference this has made already. We will save money on our electric bill, keep the water warm no matter what the outside temperature, and keep the hounds cozy, too. We are already saving man-hours. John and Toot are thrilled. I do not have a list of everyone who worked on this project. If I can get one, I will publish it because we had quite a team. I cannot thank you all enough. On another note, I ask your indulgence. Due to all that has transpired plus my rewrite (finished!) I have not gotten the jump signs painted. If I can get the fixture card put to bed, I will get the materials to the sign painter before Christmas. If not, immediately there after. The response to this idea has been wonderful. I had not a clue to what an educated group you all are. Better yet, we can and do ignore it when we feel like it. Thank you for your patience. What 2017 will bring us, I don’t know but I know we are equal to it.